The Commander88 has been designed for those who want an exceptional ECU. It allows managing 1 to 8-cylinder engines in sequential injection and static ignition, and 10 and 12-cylinder engines in semi-sequential injection and lost sparks ignition. It can manage straight engines and 'V' engines as well, with a separated management for each bank of cylinders (intake, Lambda, turbos, fly by wire and camshafts for each bank). Thanks to its two high performance microprocessors and its multiple possibilities the Commander88 allows to get astonishing accelerations by a total engine optimization. Several tunings can get along for the same engine (multimapping). The desired tuning can be selected while running, by a rotator or a dashboard switch, allowing the adaptation to the driving conditions, a super boost of the engine if necessary. A full self-learning function allows the ECU to auto tune its injection time map when equipped with a wide band Lambda sensor (needs a professionnal license, or on option with standard license). The Commander66 also manages direct injection if is added a high voltage injectors driver. For a fast tuning, the maps of engine start, engine temperature rise, accelerating pumps and atmospheric altimetric pressure and intake t° corrections are preset for the ignition advance as for the injection. The PID of devices commands (electric throttles, turbo, fuel pressure) are also preset. Sequential gearbox management or specific management of robotized gearbox. The proportional positioning can be made on one or two camshafts. The turbo management is made by the PWM command of a pneumatic electrovalve of leak or a variable geometry. Wastegates with back pressure are also managed. Turbos in sequential mode are started only under selectable conditions. • Turbo management in pressure or in turbo rpm or both with dynamic choice of the type of management. • For 'V' engines with intake separated by bank, it is possible to read 2 pressure sensors, each allocated to a bank of cylinder, to manage each of the twin turbos with its own pressure. See Direct injection inductive kit and Direct injection piezo kit. The use of these advanced functions and the development of specific strategies does not require either the learning or the knowledge of a programming language. The innovative and natural technique, called SKYMCOD Mapped programming, developed by Skynam, performs this role. Two completely programmable auxiliary CAN-BUSes (11 and 29 bit identifiers, speed until 1 Mbits) allow to exchange data with the others connected nodes, car manufacturer devices or data recording or dashboard. The received data can be used in the advanced functions of calculations and developments of strategies. 23 completely programmable auxiliary outputs. They can be configured in On-Off (programmable hysteresis), PWM from 10 to 10000 Hz or angular or engine synchronous phased commands, with adjustable cyclical ratio (and phase), and controled by any combination of parameters known by the ECU, including the values received from the auxiliary CAN-BUSes, and or from the sophisticated strategies developed by the motorist and fully configurable PIDs. 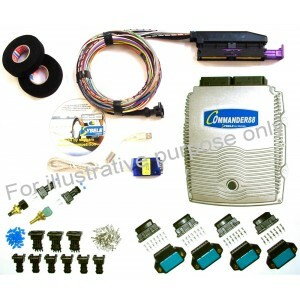 • The kit is made of the Commander88 ECU supplemented with accessories to install it on the engine. The kit we provide is specifically designed for 8-cylinder engines with full monostatic ignition and sequential injection. If your engine has a higher number of cylinders, you maybe need to purchase some complementary accessories. In any case, report to kit complements below to verify your needs. • The CAN-BUS connection-to-PC kit is not included in the ECU kit. It is to be ordered in option or to be purchased separately. It is essential to be able to connect your PC to the Commander ECUs and tune the engine. This loom is pre-wired on the ECU side connector, with sensors and actuators connectors not installed. You have to contact the Skynam technical service to detail the complete making of your loom (see contact page). • The loom is completely sheathed with braid sleeving. • The lengths of the various branches are standard (2 meters) or customized (lengths provided to Skynam). • The connectors of the standard sensors* and standard actuators* are installed. • The connectors of the other sensors and actuators are to install or are to provide to Skynam. • The fuses and relays bases are installed if required. The connection kit is to be ordered in option or can be separately purchased. It is essential to be able to connect your PC to the Commander ECUs and tune the engine. The CAN-USB interface is the same for all Commander ECUs (gasoline and diesel). *Skynam uses a Lawicel interface specifically designed. The other CAN-USB interfaces (even other Lawicel) found on the market cannot work with Winjall. More, this special interface is equipped with an enhanced protection against electromagnetic spikes emitted by the engines. You can download the installation CDROM parts from the Skynam website. The kits we propose are specific to 6-cylinder engines with full monostatic ignition and sequential injection. To use them with a higher number of cylinders, you will need some complementary accessories. Uses 1 single ignition module or 1 dual igition module (included in the kit). Uses 1 dual ignition module (included in the kit). Uses 2 dual ignition modules (included in the kit). Uses 3 dual ignition modules (included in the kit). Uses 4 dual ignition modules (included in the kit). Uses 5 dual ignition modules (from which 3 included in the kit). Uses 6 dual ignition modules (from which 4 included in the kit). For complementary details, report to the installation notice included in the software Pack that you can download from our site.